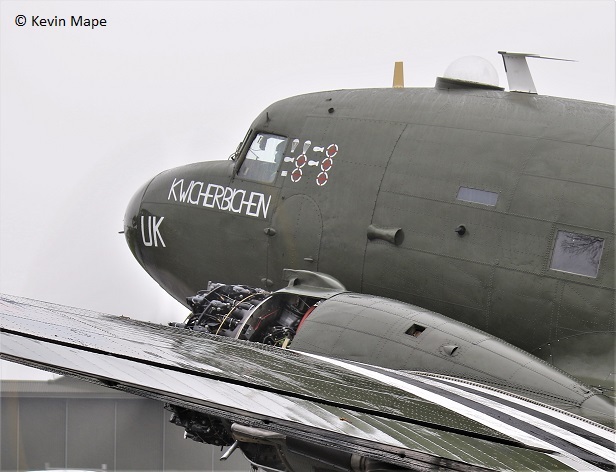 April is the start of the BBMF’s work up towards the PDA later this month, I would expect to see the Dakota have it’s first flight of the year this first week of April. TE311 Spitfire LF XVIe is to fly in it’s matt black undercoat and will make for a few different pictures before departing for respray into it’s new 302(Polish) Sqn marks. 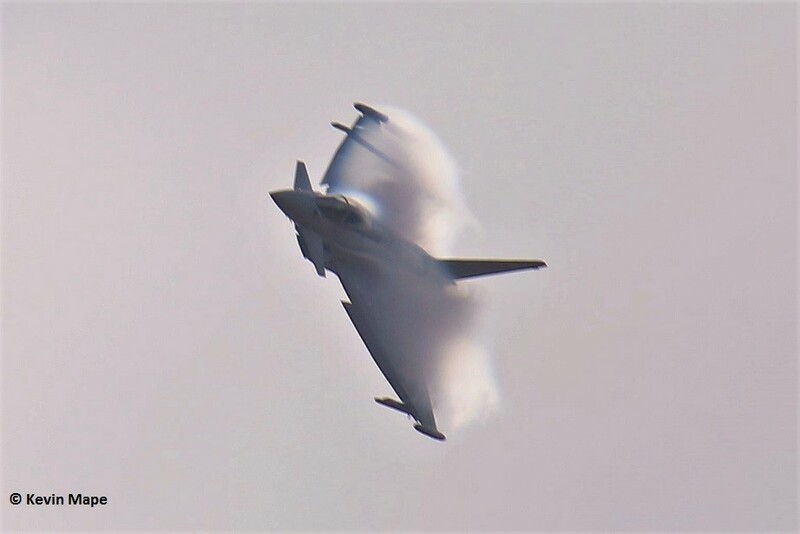 Flt Lt Ryan Lawton is making good progress with his Typhoon Display , A great display in the making with lots of high speed, Burner and noise , I look forward to seeing the final display as the weeks go by. 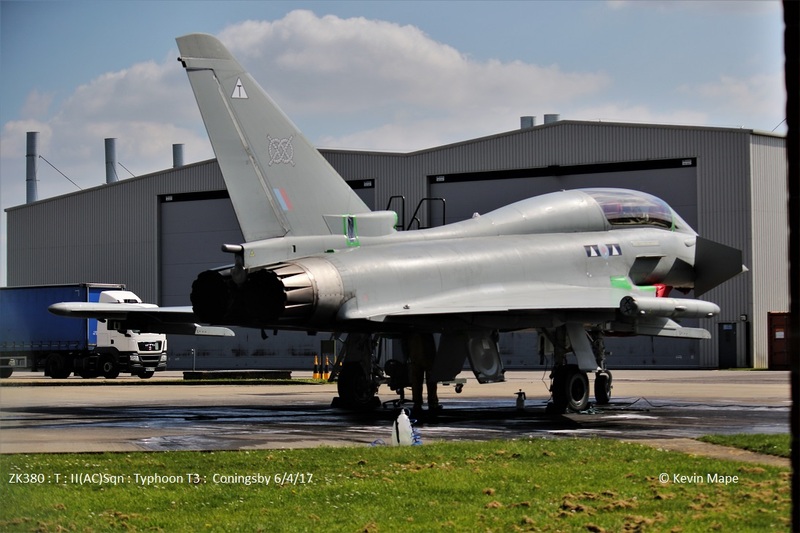 ZK349/(BZ) GN-A the Camo Typhoon has entered the paint shop and is being returned to grey. 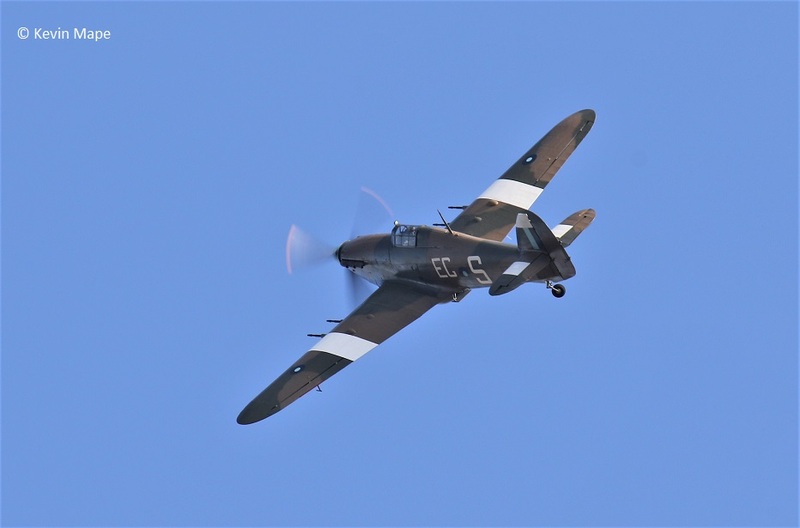 The BBMF PDA has been moved to the second week in May, This is due to the lack of available Aircraft at this time. ZK345/EP code only – Noted on the wash pan. P7350/EB-G/Spirfire IIa – Engine run. ZK332/EB-J code only – Noted on the Wash pan. ZK349/GN-A/29(R)Sqn special – Noted outside TMF. ZK380/T/II(AC)Sqn – Towed into TMF APU tunnel. F-GULY/King Air C90 c/s “FGULY” – Parked on Sierra. ZJ813/BL/29(R)Sqn (WFU) – Noted outside 29(R)Sqn Hangar. 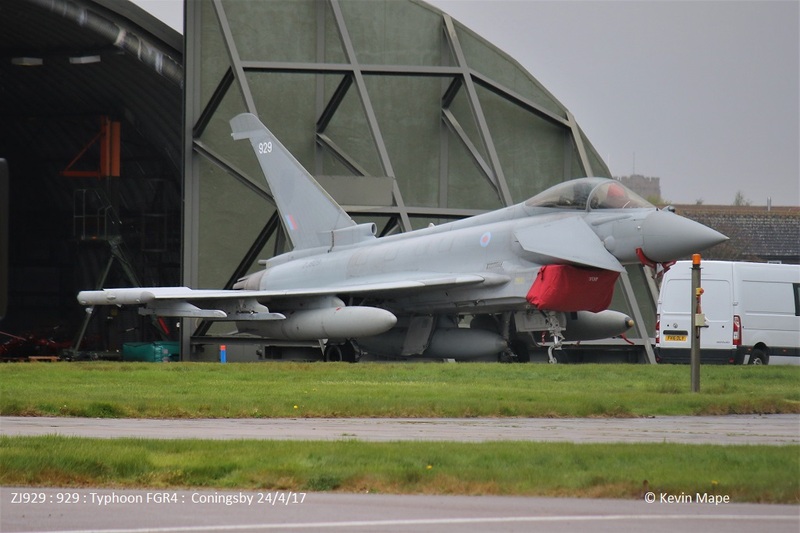 ZJ942/DH/XI(F)Sqn c/s “0MT 47” – QRA start up – later cancelled. 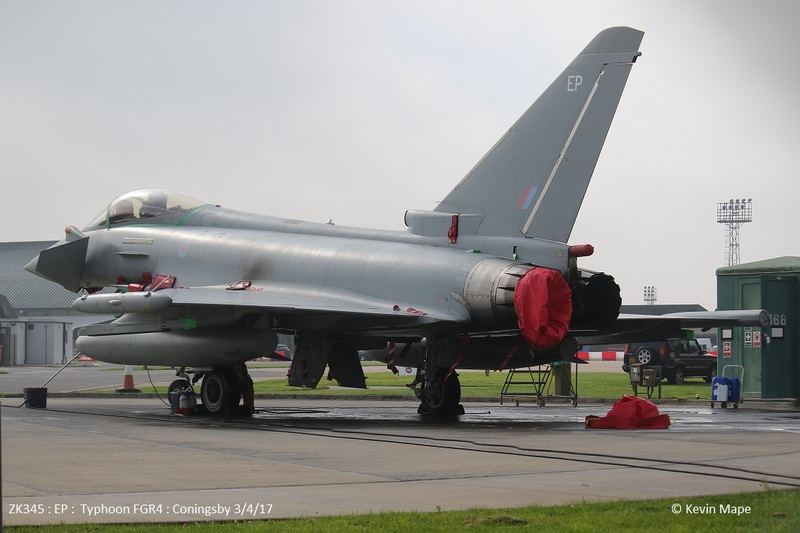 ZK328/EB/6Sqn – Towed from TMF to the ASP – Engine runs. ZK459/X/45(R)Sqn 100 year special/King Air B200GT c/s “Cranwell 84” – Overshoots. 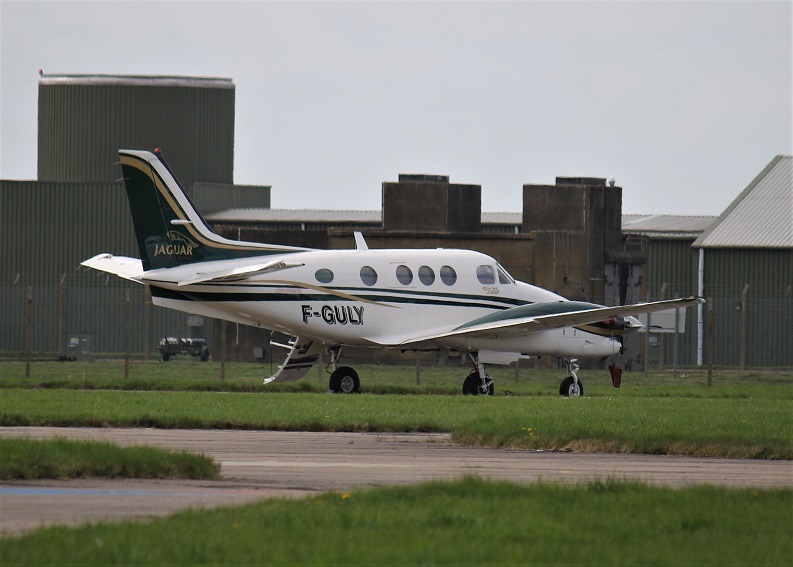 ZK459/X/45(R)Sqn 100 year special/King Air B200GT c/s “Cranwell 63” – Overshoots. ZK349/GN-A/29(R)Sqn special – Towed into the Old paint shop. PS915/Spitfire PR XIXe – Engine runs. ZJ921/E code only – Towed from Foxtrot to Hangar 2. ZJ921/E code only – Towed back to Foxtrot. 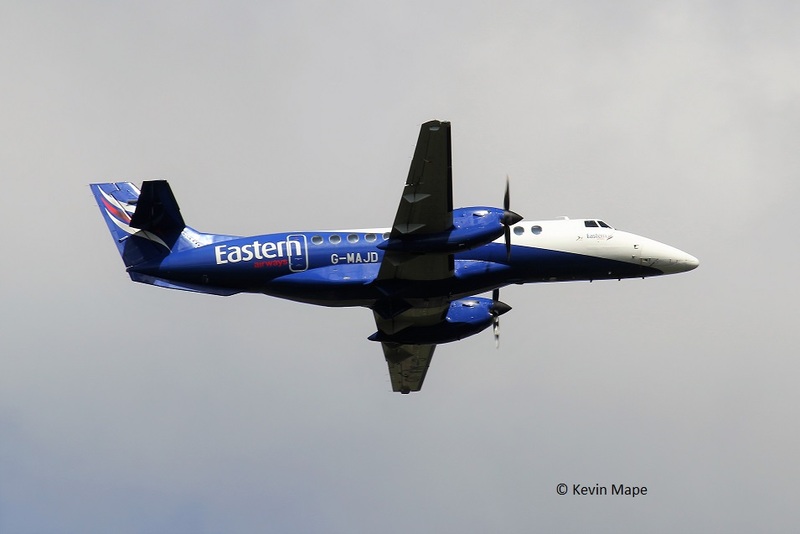 G-MAJJ/JJ/Eastern/Jetstream 41 c/s “East flt 105” in “106” – out. 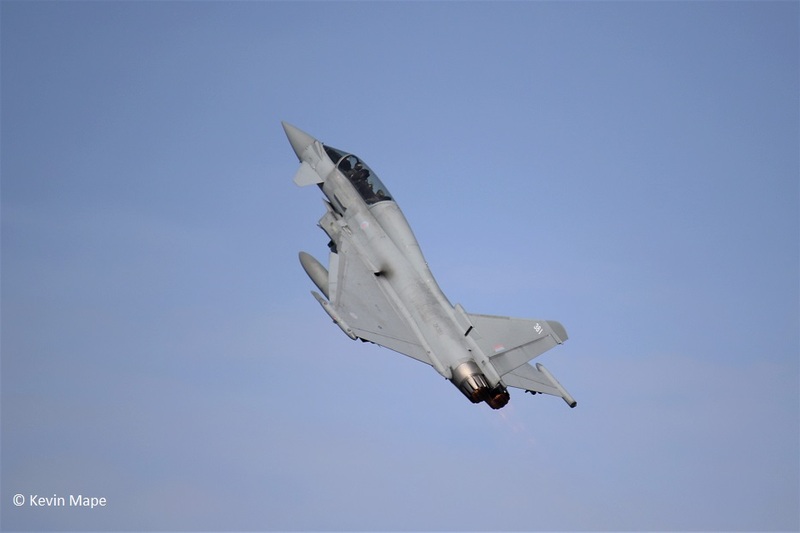 ZJ802/DW/XI(F)Sqn out as c/s “Chaos 12” in as c/s “Typhoon 08” – PD Leeds – Bradford. 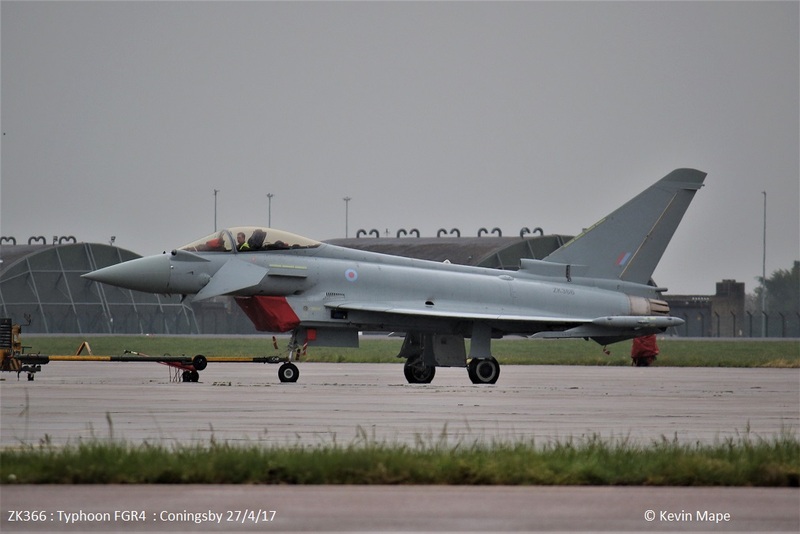 QRA Change over – ZJ914/DZ/XI(F)Sqn – HAS 1 to HAS 3. ZK380/T/II(AC)Sqn – Noted on the Wash pan. 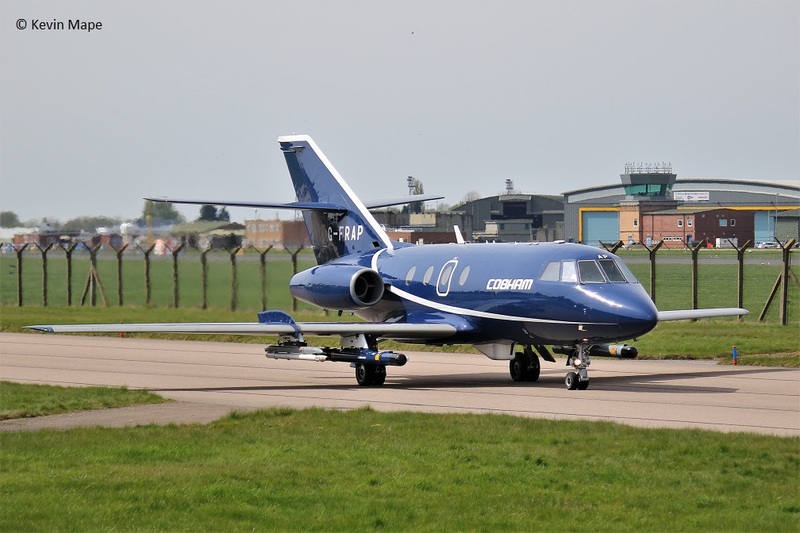 G-FRAH/AH/Cobham/Falcon 20EW c/s “Mothball 92” – Parked on the ASP. “Apollo 12” ground abort fuel spillage on taxi way. 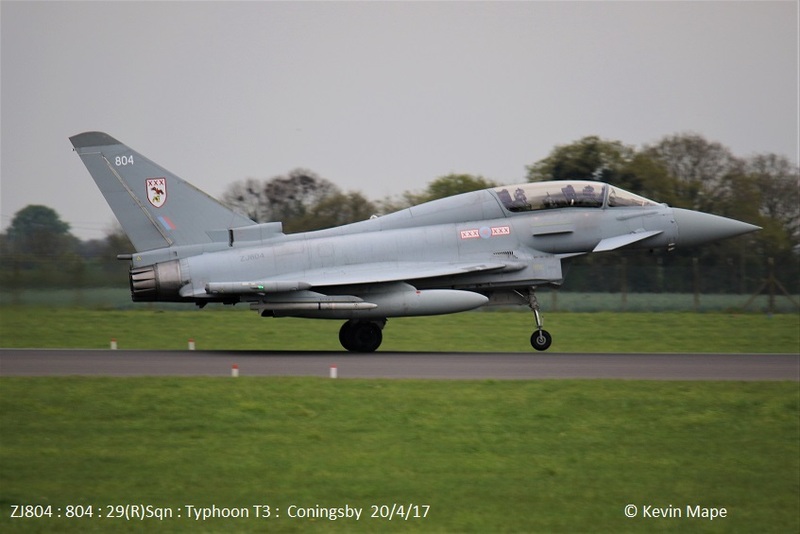 ZJ930/930 code only c/s “Typhoon 118” – PD at Marham. 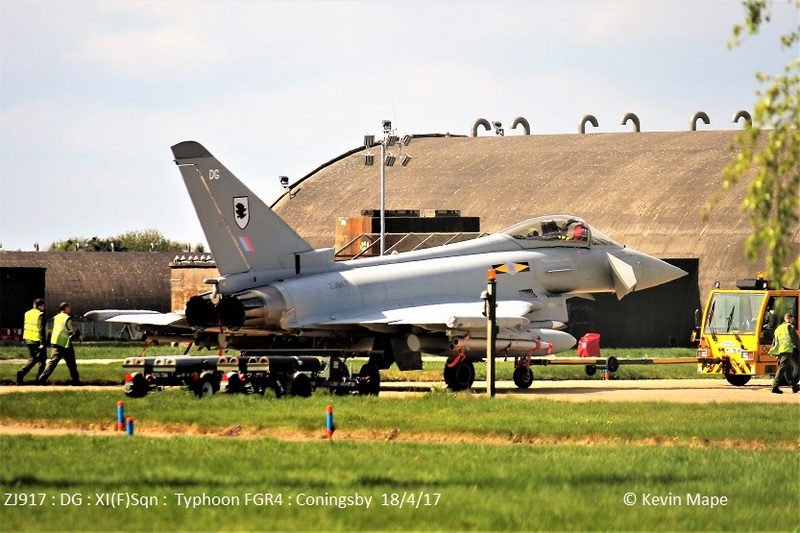 ZK352/BV code only c/s “Typhoon 105” – PD at Marham. 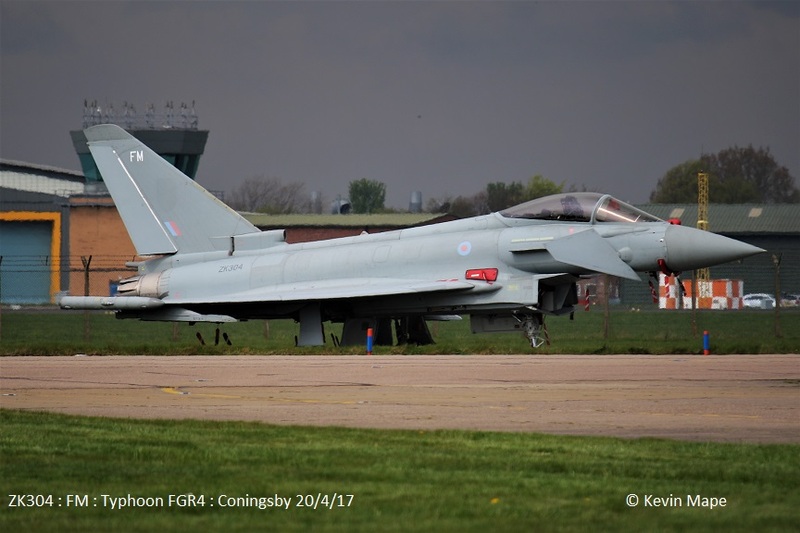 ZK354/BY code only c/s “Typhoon 110” – PD at Leeming. 7th Fri Log thanks to Carl & Sam. 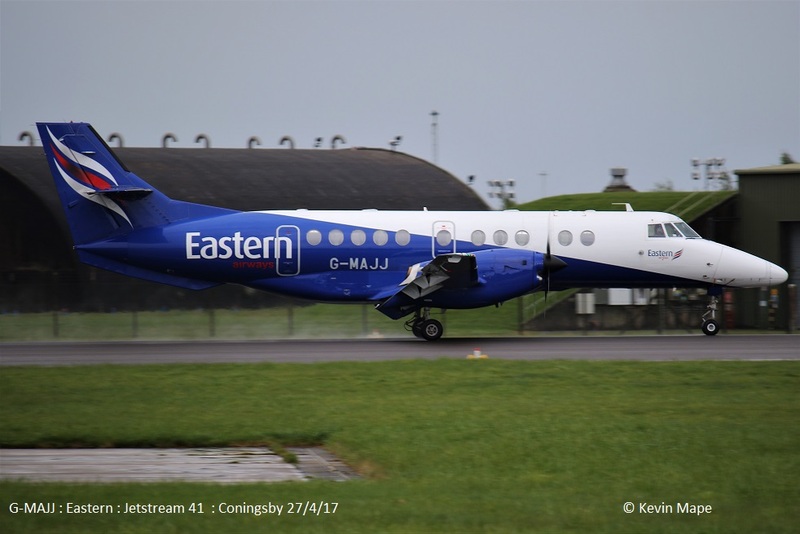 G-MAJJ/JJ/Eastern/Jetstream 41 c/s “East Flt 101” in, “102” out. ZJ921/E code only – Noted on the Wash pan. 10th Mon Log thanks to Garf, Susie & Mark. 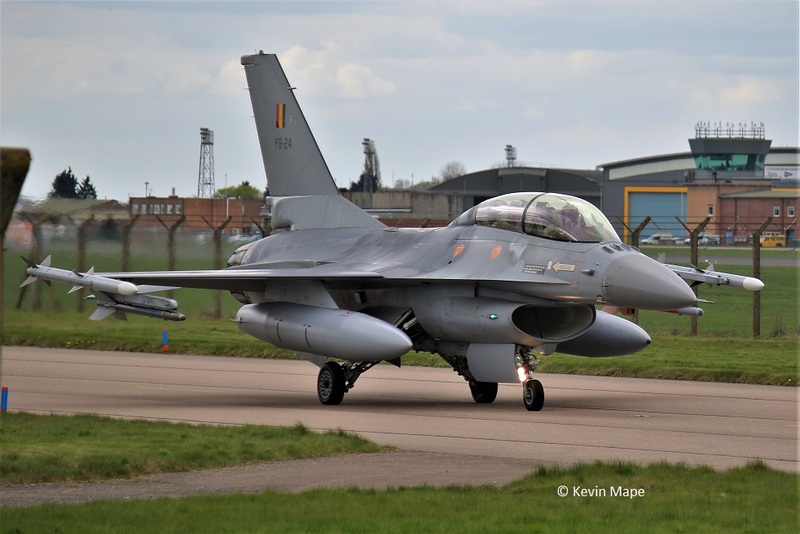 FB-24/10Wing/F-16BM c/s “Belgium Air Force 451” – Overshoots then landed – Parked on Serra. ZJ927/927 code only c/s “Cobra 21” – f/n as 927 code only ex Unmarked. PZ865/EG-S/BBMF/Hurricane IIc c/s “Hurricane 90” – Air test. 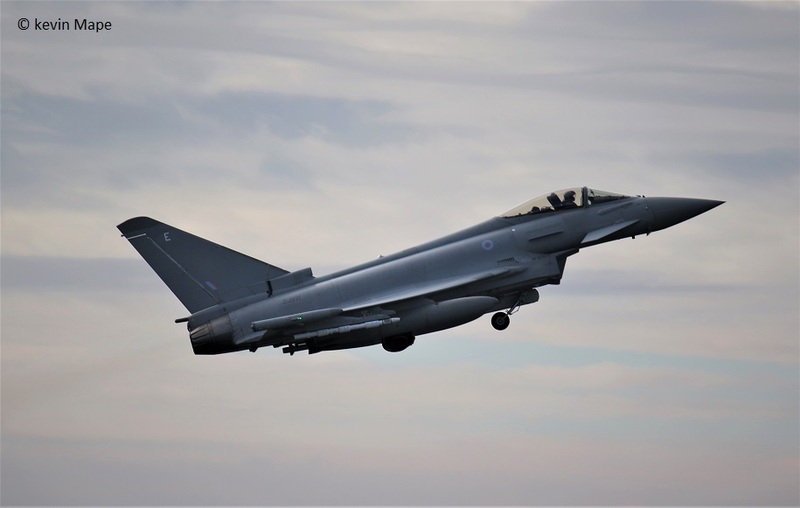 ZJ928/928 code only c/s “Nightmare 13” – f/n as 928 code only ex FQ/1(F)Sqn marks. 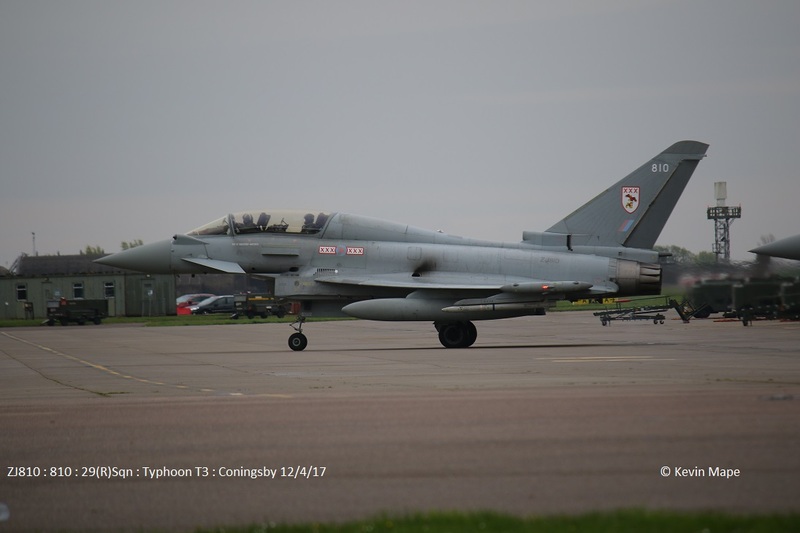 ZJ810/810/29(R)Sqn c/s “Typhoon 05” – PD at Marham. 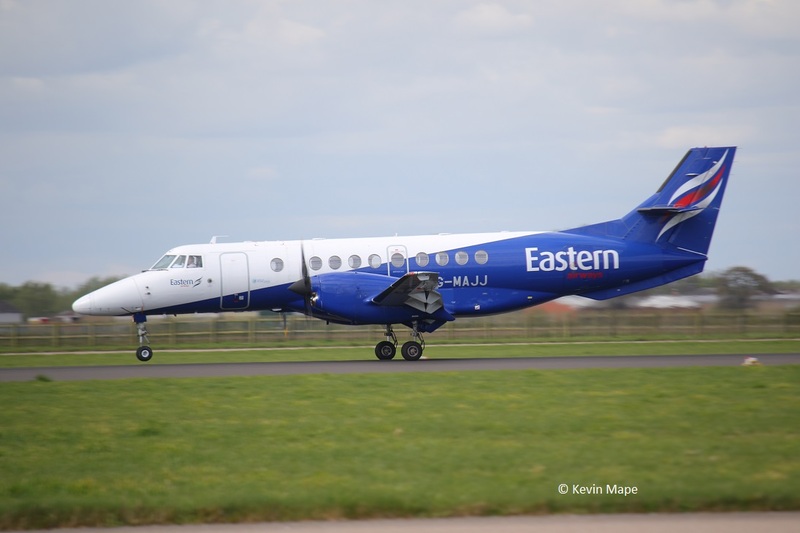 G-MAJJ/JJ/Eastern/Jetstream 41 c/s “East Flt 102” in “105” out. 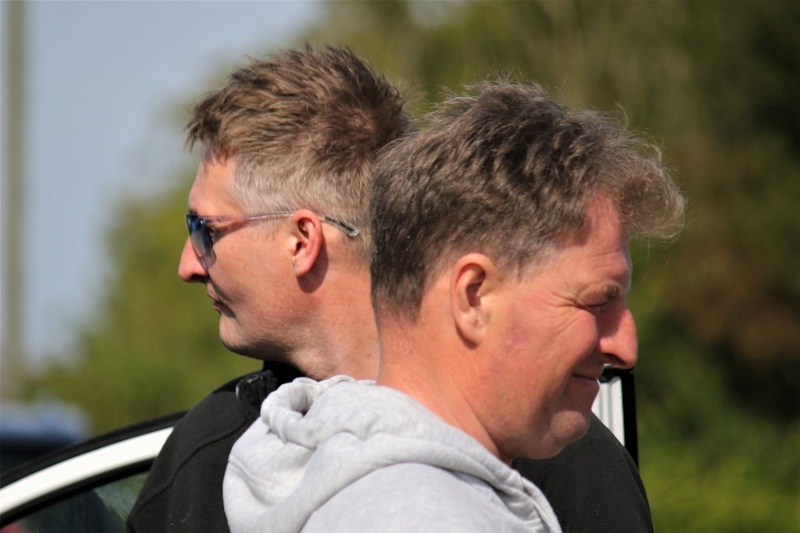 ZJ942/DH/XI(F)Sqn – QRA radio check 15-45pm. 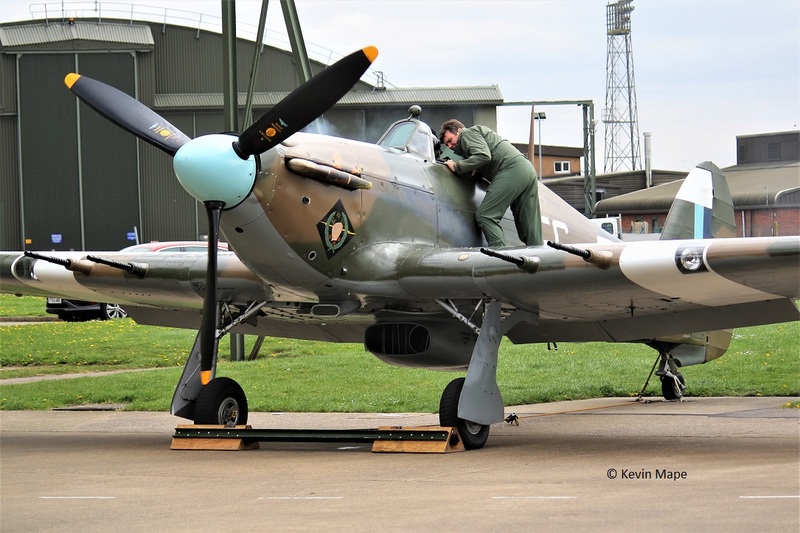 PZ865/EG-S/BBMF/Hurricane IIc – Engine start up with OC Sqn Ldr Andy Millikin holding onto the Cockpit outside. the flames are showing on the pots. 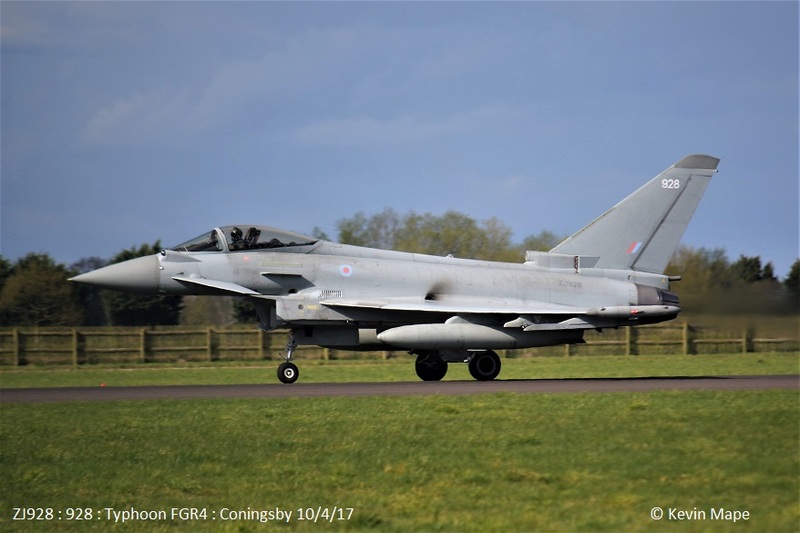 ZJ917/DG/XI(F)Sqn – QRA fit – to HAS 1. ZK380/T/II(AC)Sqn -Noted in the TMF APU Tunnel. ZK310/310 code only – Towed from Echo to Hangar 2. – f/n with 310 code. “Triplex 11” – Ground abort. G-FRAO/AO/Cobham/Falcon 20EW c/s “Vader 61” – Parked on the ASP. 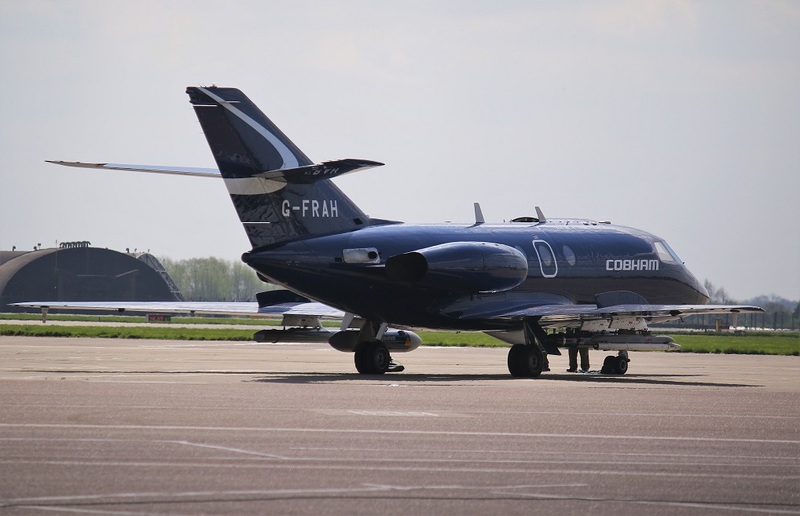 G-FRAF/AF/Cobham/Falcon 20EW c/s “Vader 62” – Parked on the ASP. ZK310/310 code only – Towed back to Echo from Hangar 2. PZ865/EG-S/BBMF/Hurricane IIc c/s “Hurricane 01” -Circuits then land. 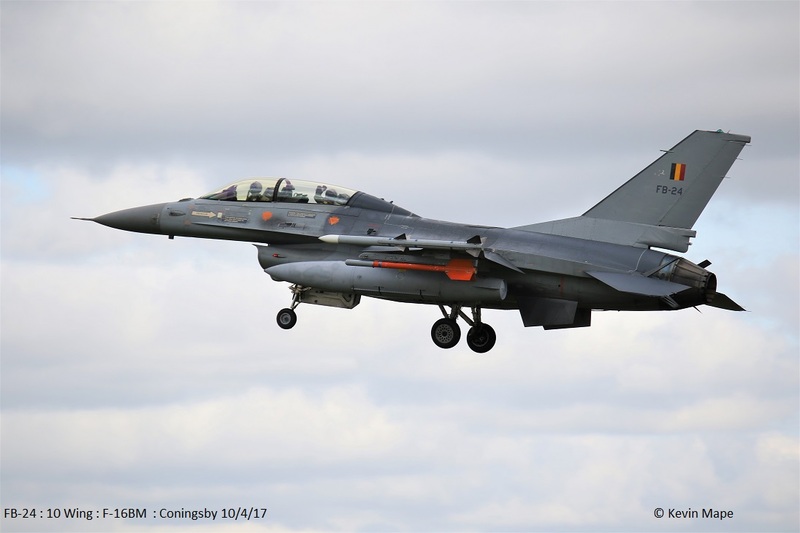 01-2000/LN rd/48FW/F-15E c/as “Casino 41” – Low approach with :-. “Gunfighter 63” – Ground abort. 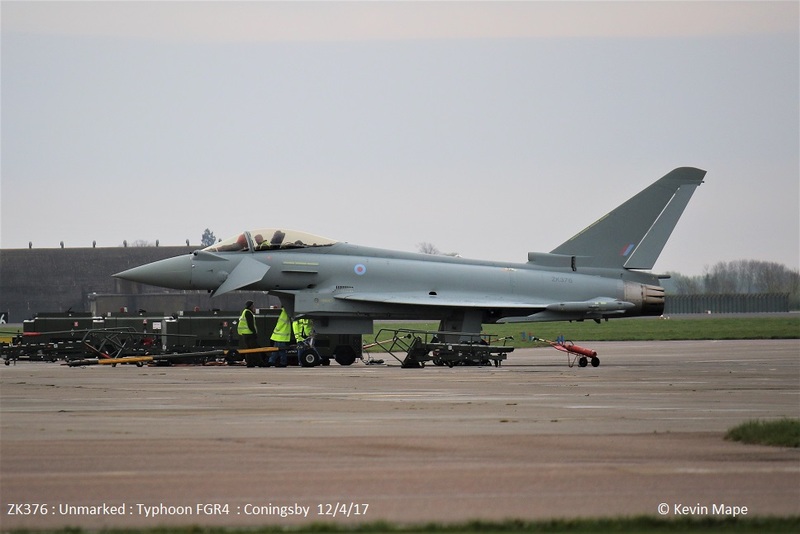 ZJ917/DG/XI(F)Sqn – Towed from XI(F)Sqn flight line to HAS 1. 12th Wed Log thanks to Susie. 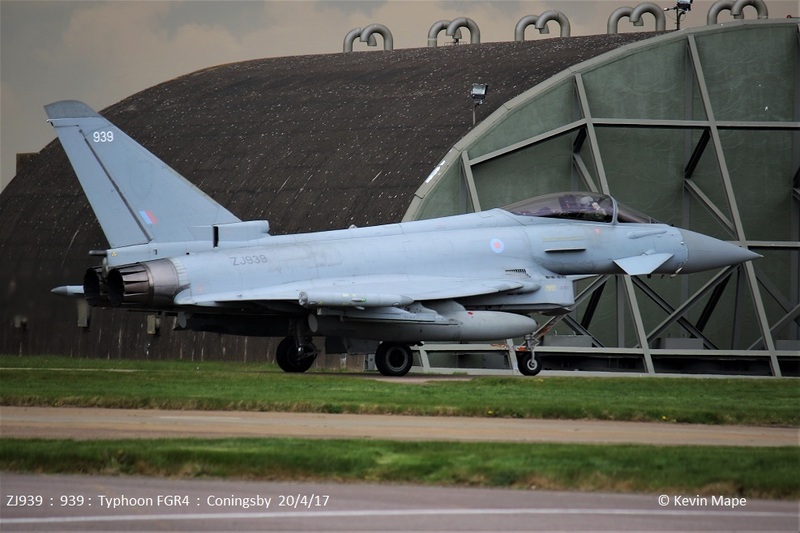 ZJ914/DZ/XI(F)Sqn c/s “GE Connect 42” – QRA practice. XW231/Puma HC2 c/s “V0rtex 300 ” Parked on Sierra. “Razor 42” – Ground abort. 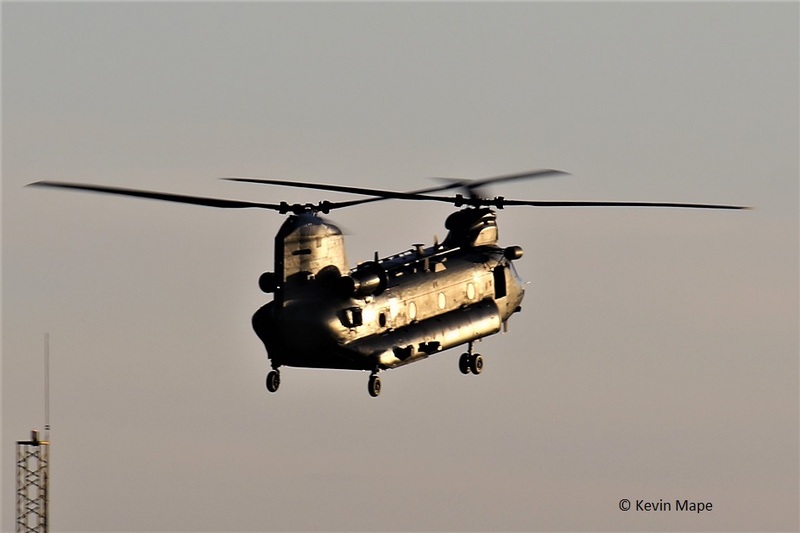 ZA675/Chinook HC4 c/s “Vortex 421” – Overfly – Heading North. ZK376/Unmarked – Noted on the ASP. ZA559/049/Unmarked /Tornado GR4 c/s “Ascot 9801”. – Returned from USA deployment. ZA560/EB-Q/41(R)TES /Tornado GR4 c/s “Ascot 9802”. 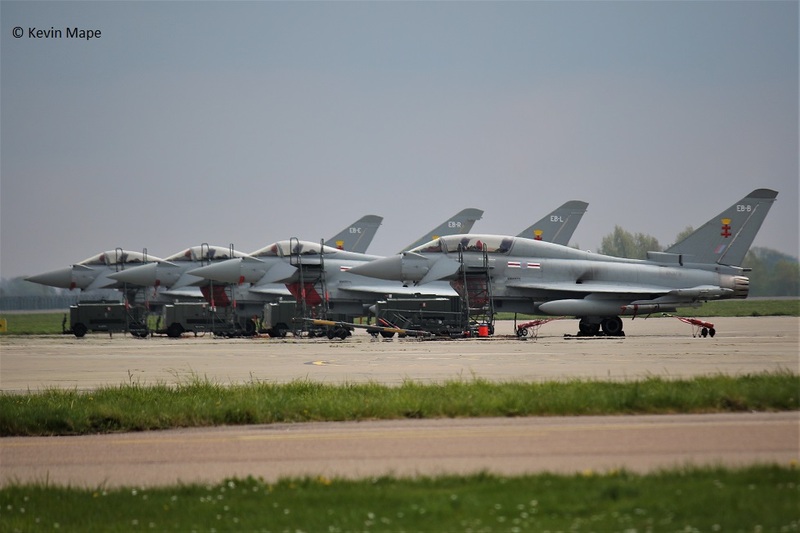 41(R)TES – EB-E, EB-B, EB-R,EB-L.
29(R)Sqn – BD, 814, 930, BV, BE, 810, BY, BC, BG. G-MAJD/JD/Eastern/Jetstream 41 c/s “East Flt 102” in, “103” out. 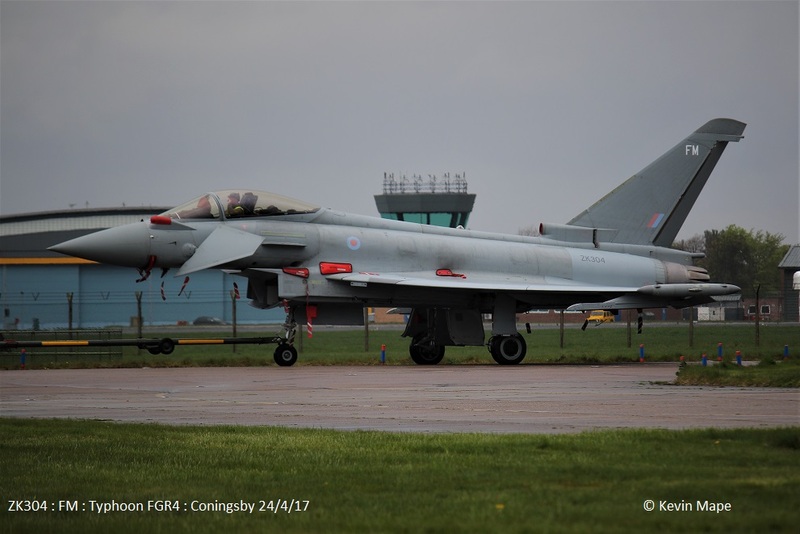 ZK375/Unmarked c/s “Tarnish 29” – Delivery from Warton. G-MAJD/JD/Eastern/Jetstream 41 c/s “East Flt 104” in, “105” out . 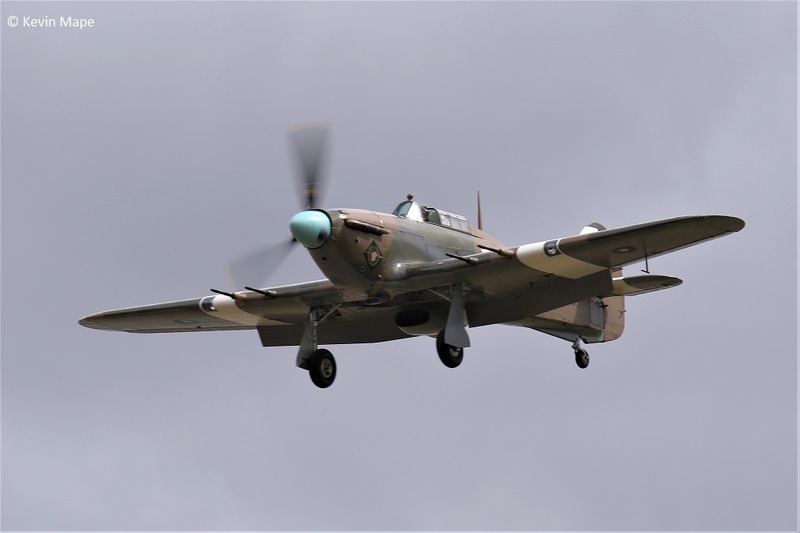 P7350/EB-G/BBMF/Spitfire IIa c/s “Spitfire 90” – Air test. 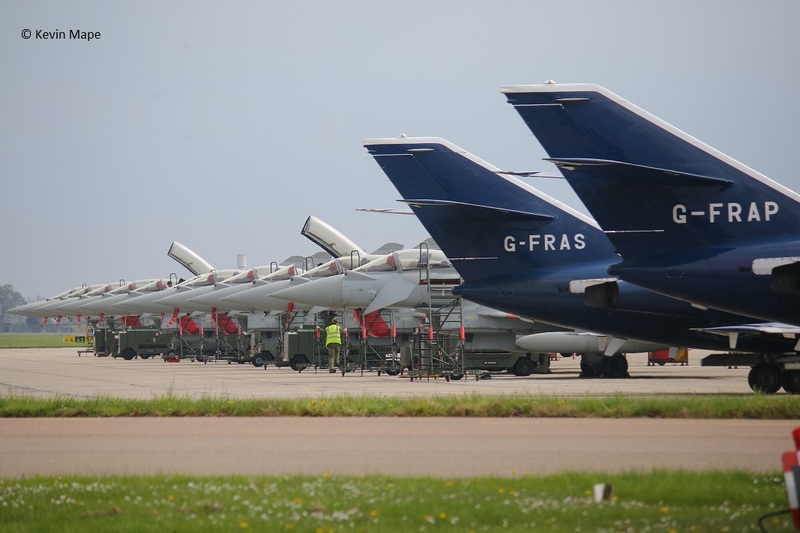 ZJ917/DG/XI(F)Sqn – HAS 3 to Has 4. 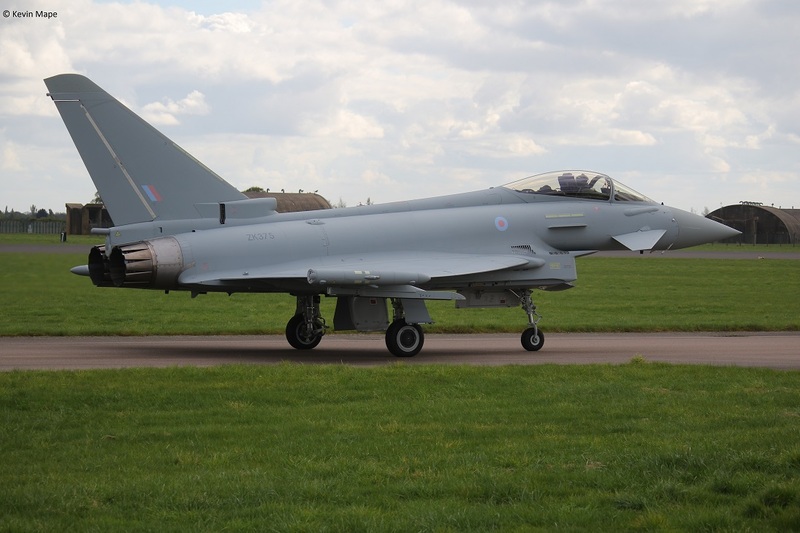 ZJ929/DL/XI(F)Sqn – HAS4 to HAS 1. ZK332/EB-J code only – HAS 1 to HAS3. 19th Wed Log thanks to Garf,Phil,Mark & Susie. 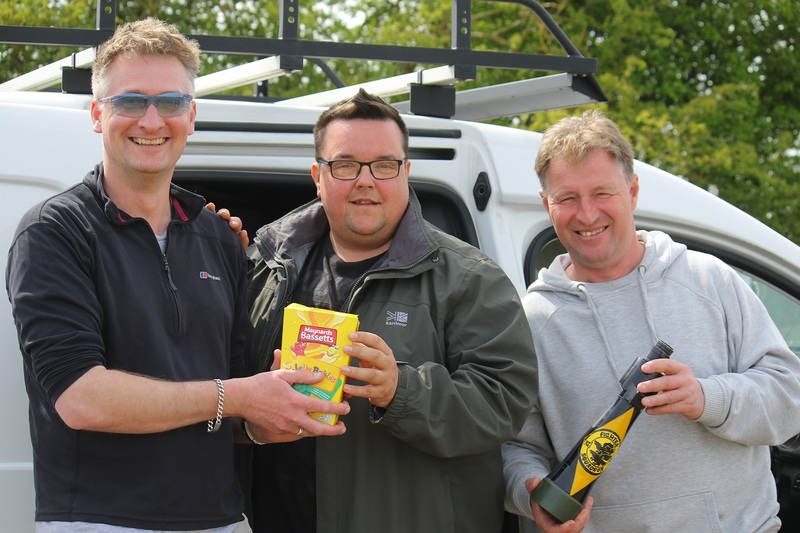 Good to see everyone today at the Base, It was nice to spend a few hours with Phil Taylor and the rest of the Reedham crew. ZK310/310 code only c/s “Rafair 7003” – Departed. G-MAJD/JD/Eastern/Jetstream 41 c/s “East Flt 101” in, “102” out . 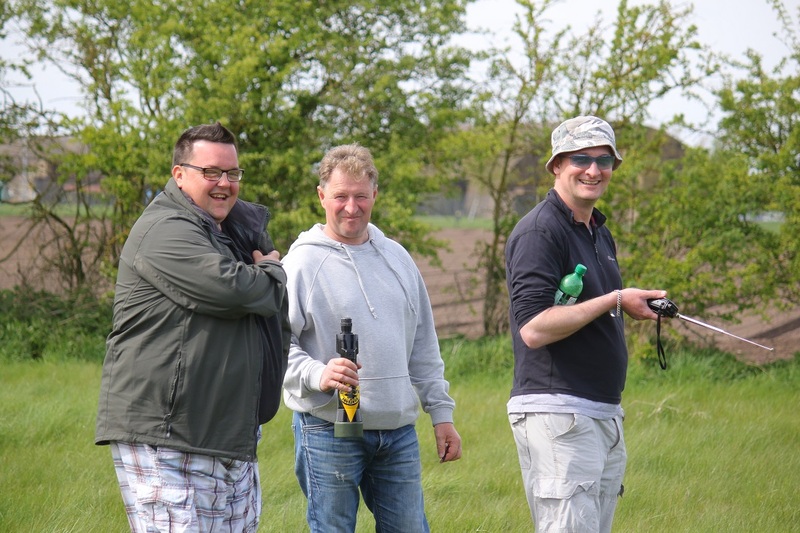 ZJ917/DG/XI(F)Sqn – QRA radio check. – 11-46am. 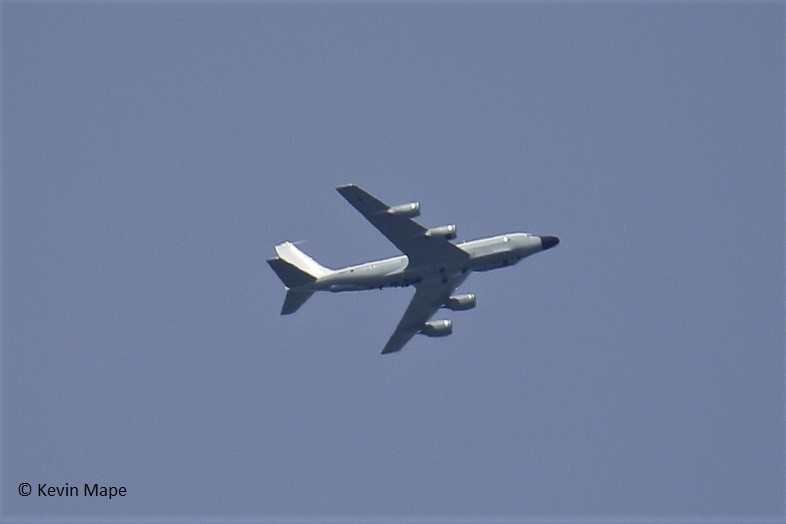 ZZ665/51Sqn/RC-135 Airseeker R1 c/s “Rafair 7230” – overfly at 13-03pm. 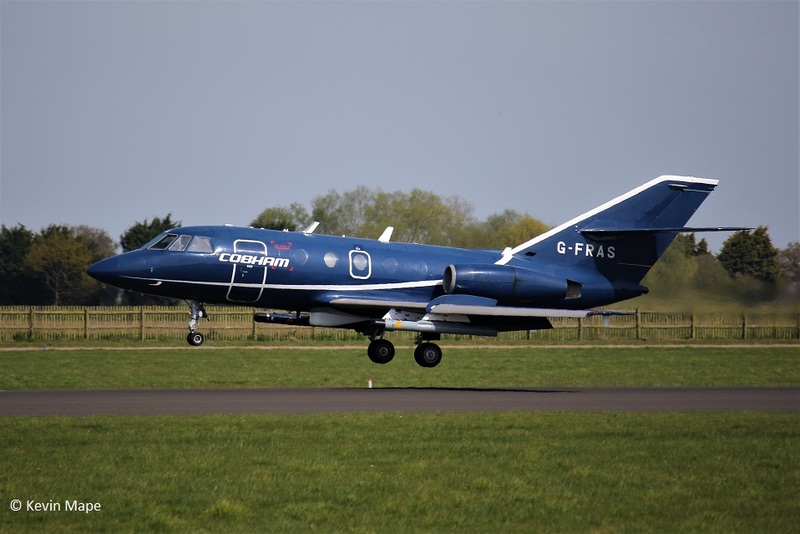 G-FRAP/AP/Cobham/Falcon 20EW c/s “Vader 62”- Departed. ZG750/128/Granby special/Tornado GR4 c/s “Marham 03” – Rollers. G-MAJD/JD/Eastern/Jetstream 41 c/s “East Flt 105” in, “106” out . ZK304/FM code only – Towed from TMF into Echo. 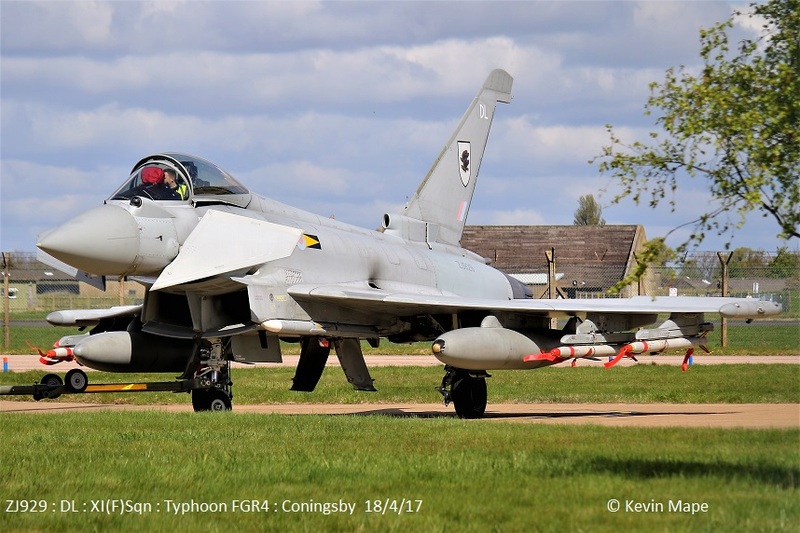 ZJ804/804/29(R)Sqn – f/n with new code. ZJ939/939 code only c/s “Chaos 12” (hot pit) – f/n with code change. 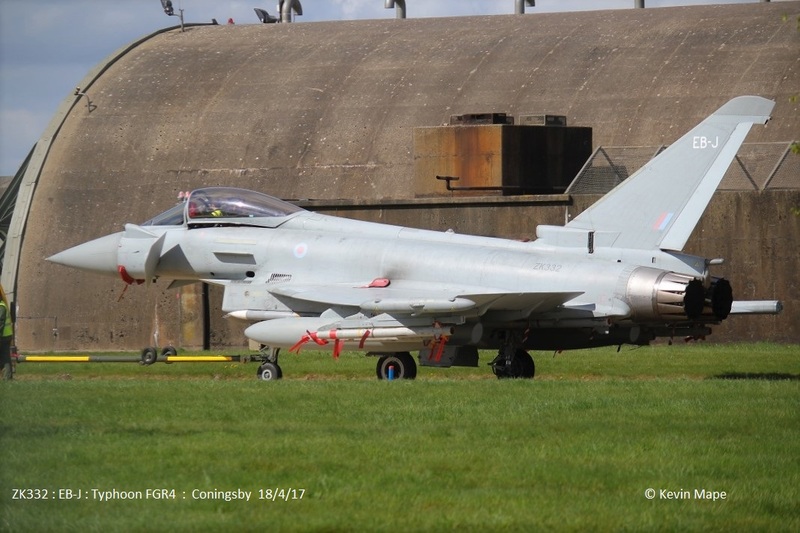 ZJ804/804/29(R)Sqn c/s “Triplex 42” – f/f in new code. G-MAJD/JD/Eastern/Jetstream 41 c/s “East Flt 104” in, “105” out. ZJ921/921 code only – Towed from North side to Foxtrot.- f/n with new code. 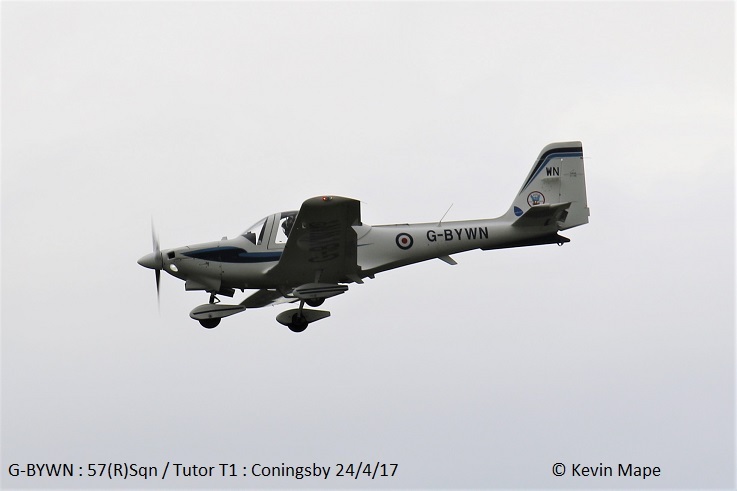 Cobham – G-FRAP, G-FRAS . 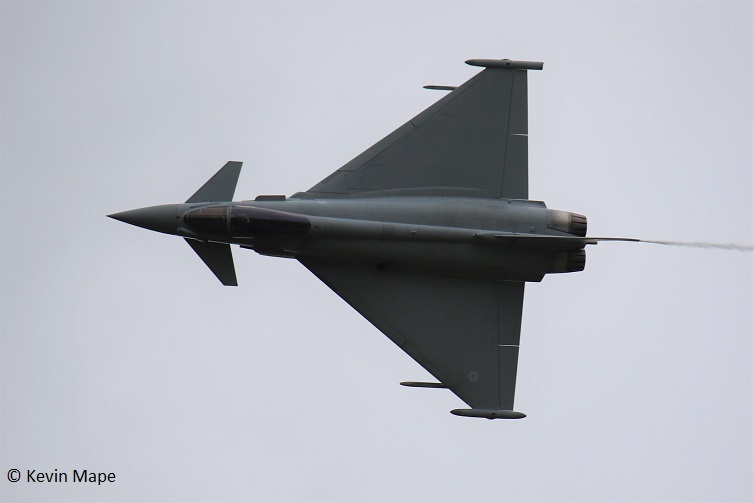 29(R)Sqn – 804, BE, BC, 814 ,810, BG, BV, 373, FY, 381, 930 . ZA607/EB-X/41(R)TES c/s “Ascot 9803” – Return from USA deployment. 21st Fri Log thanks to Susie. 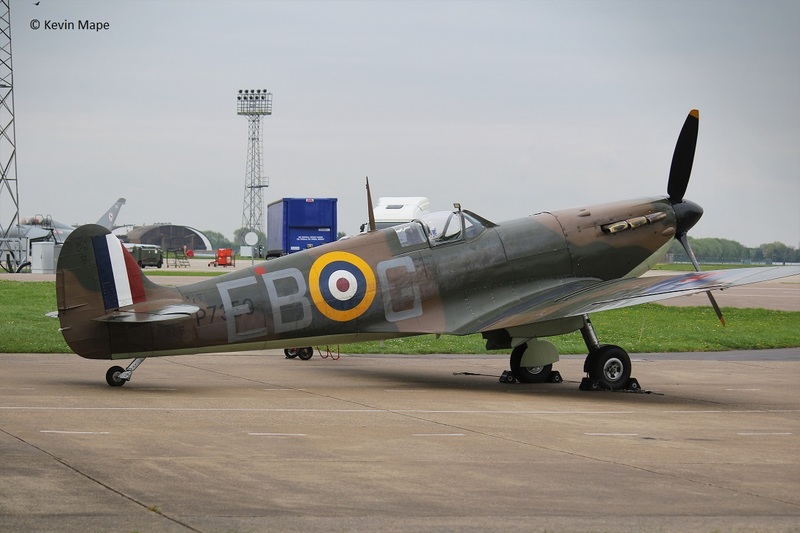 P7350/EB-G//BBMF/Spitfire IIa – Noted outside BBMF. 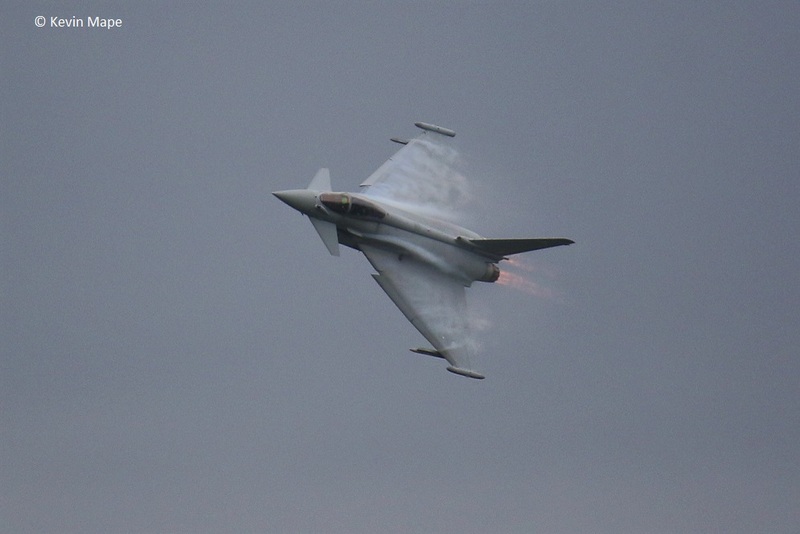 29(R)Sqn – 927, 381, 804, BY, 814, 810, FY, BY, 930. BG, 373, BE. ZJ939/939 code only – Noted on tow from Echo to TMF?………towed back over later in afternoon. 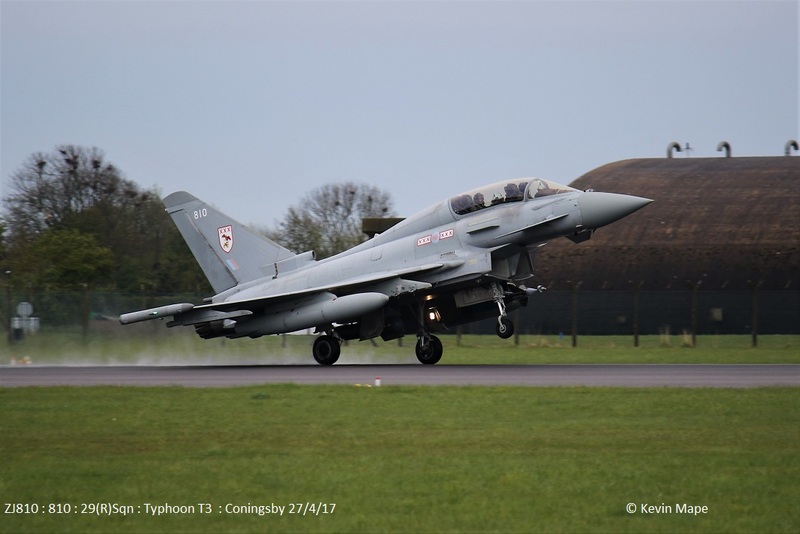 ZJ914/DZ/XI(F)Sqn – QRA to Runway 25 then returned to Shelter. 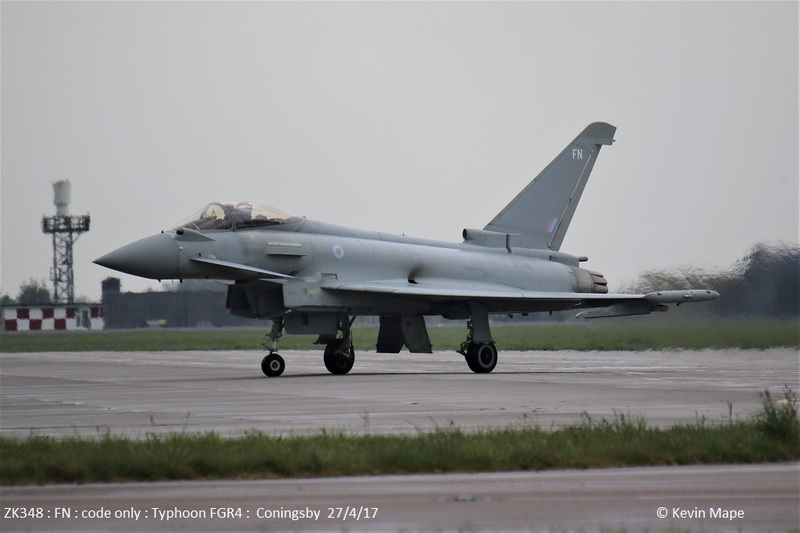 ZJ942/DH/XI(F)Sqn – QRA to Runway 25 then returned to Shelter. 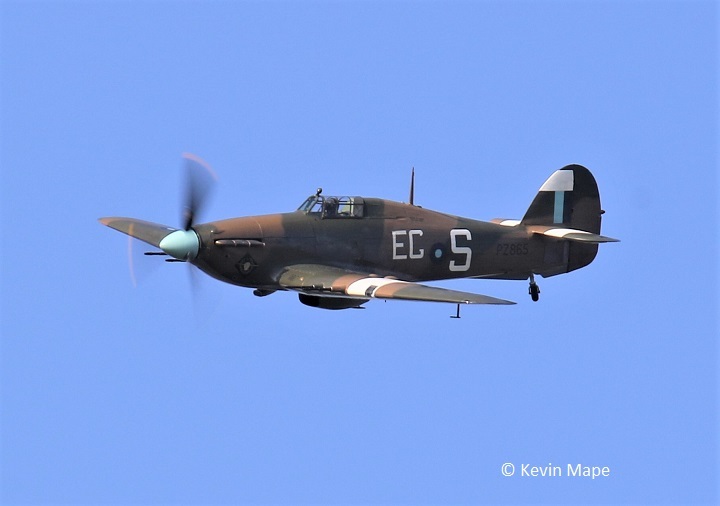 P7350/EB-G/BBMF/Spitfire IIa c/s “Spitfire 96” – First Flypasts of the season. 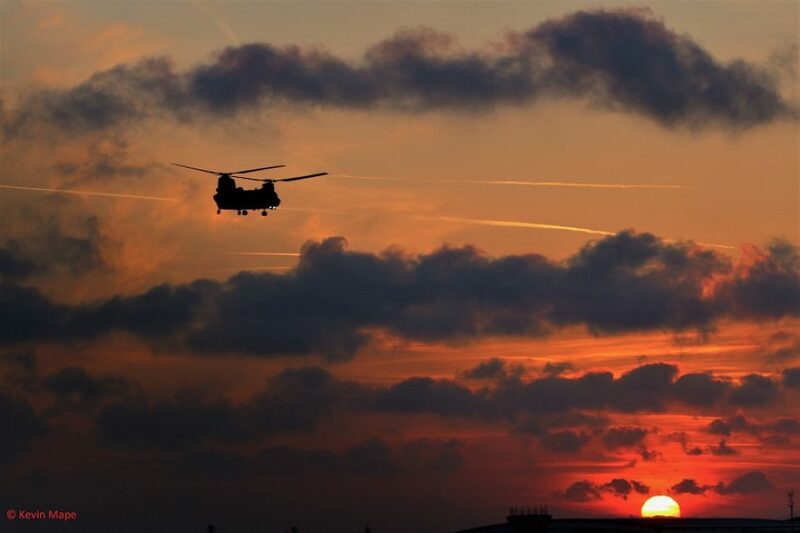 Please note 29(R)Sqn & 3(F)Sqn are on nights this week. ZJ923/923 code only c/s “Ascot 9803” – f/n as 923 code ex Unmarked. 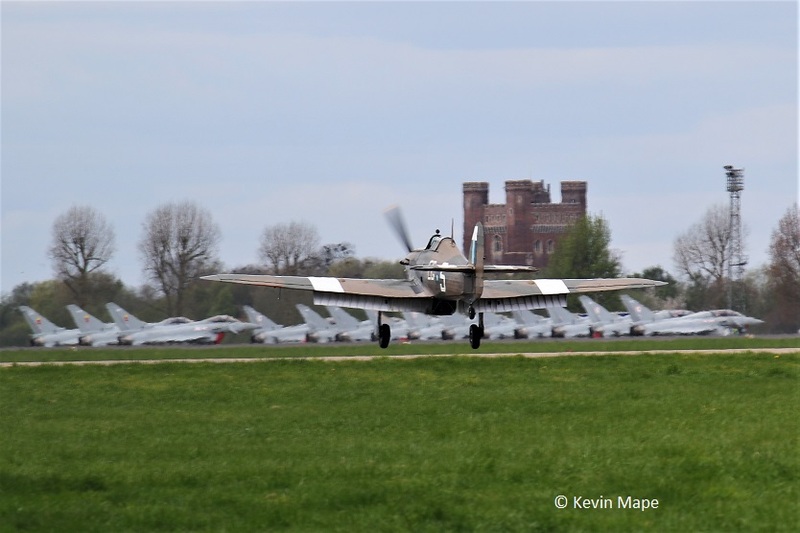 TE311/BBMF/Spitfire LF XVIe – Engine run. 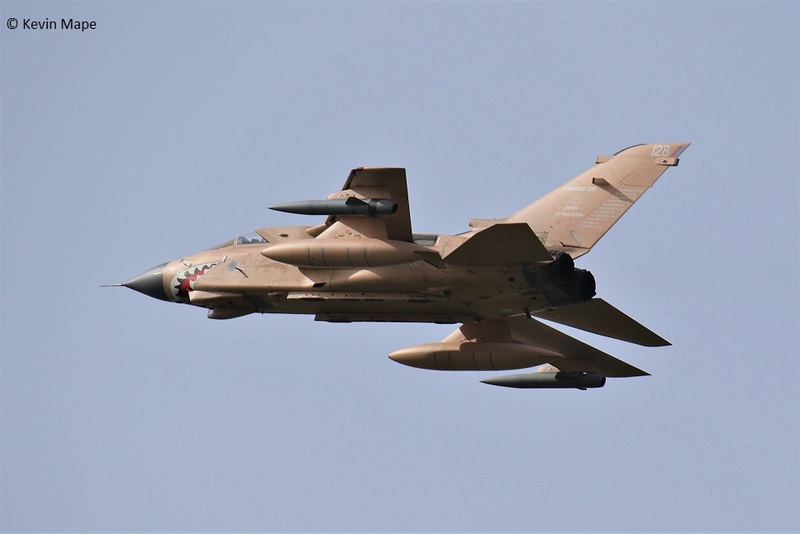 ZA607/EB-X/41(R)TES/Tornado GR4 – Noted on the Wash pan. ZA713/Odiham wing/Chinook HC4 c/s “Vortex 436” – Parked on Sierra. ZK304/FM code only – Towed from Echo to Foxtrot. ZJ929 : 929 code only – Ground spare for deployment – Noted in Echo. f/n as 929 code ex DL/XI(F)Sqn. PM Log thanks to Garf & Susie. 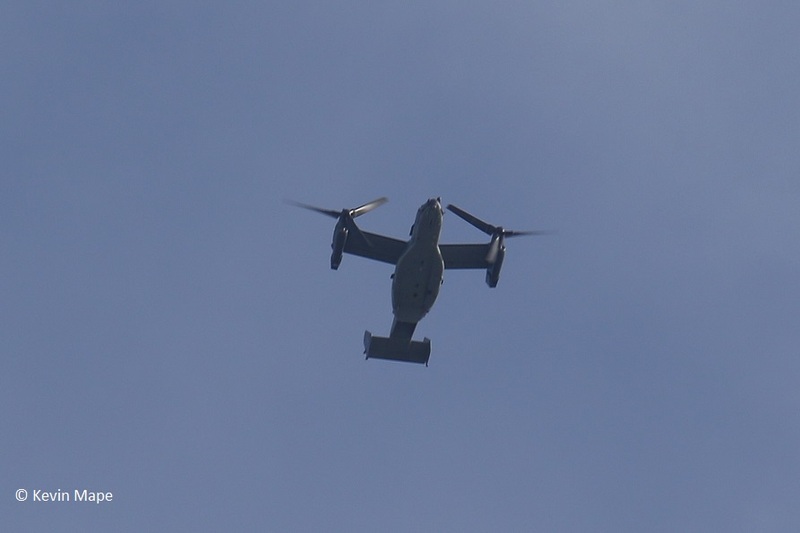 12-0063/ 352SOW/CV-22B Osprey c/s “Knife 71” Overfly south to North. G-BYWN/3FTS (57(R)Sqn badge) /Tutor T1 c/s “Cranwell 90 Yankee” – Overshoot. 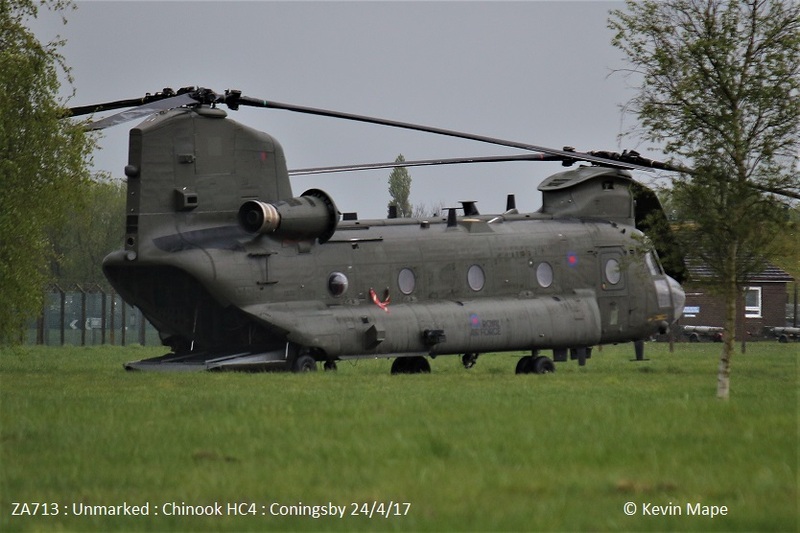 ZA713/Odiham wing/Chinook HC4 c/s “Vortex 436” – To Holbeach. Then returned to Sierra. 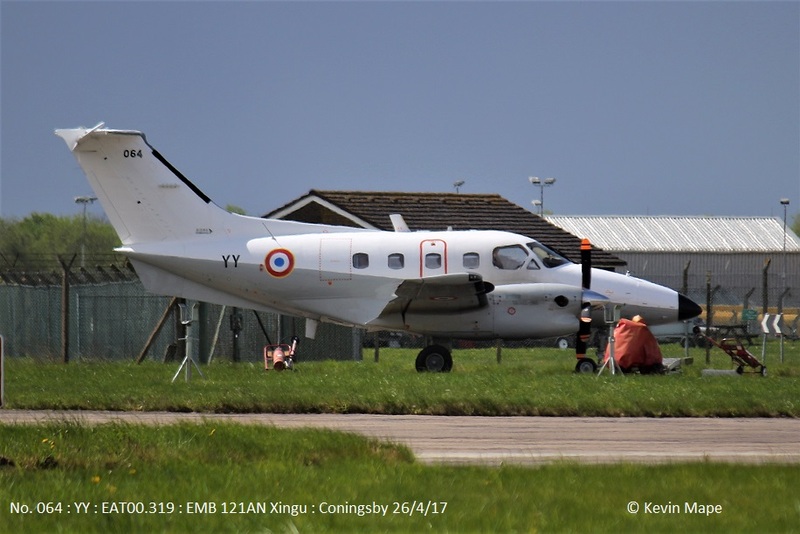 ZK458/D/45(R)Sqn/King Air B200GT c/s “Cranwell 67” – Overshoots. G-MAJD/Eastern/Jetstream 41 c/s “East flt 104” in “105” out. 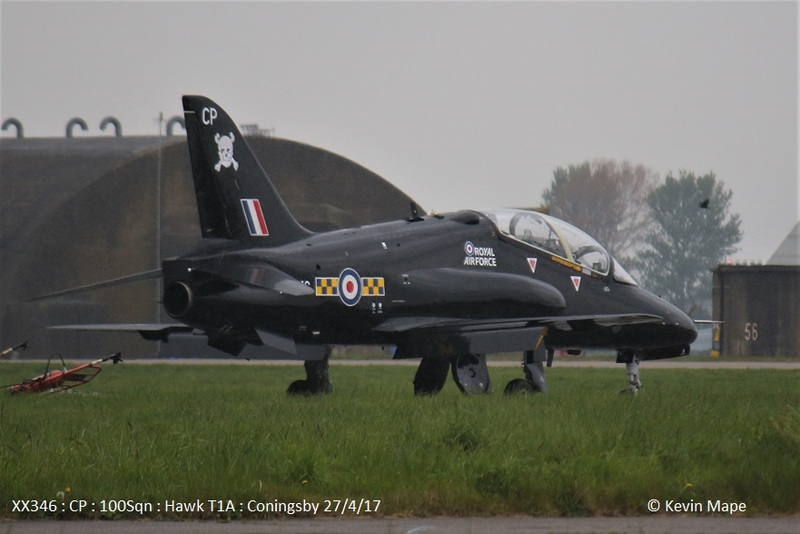 XX258/CE/100Sqn/Hawk T1A c/s “Pirate 20” – Parked on Sierra. 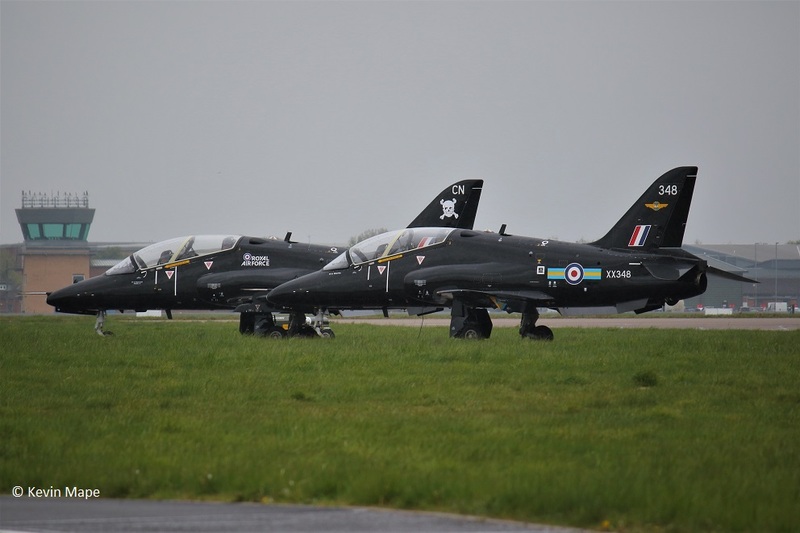 XX284/CN/100Sqn/Hawk T1A c/s “Pirate 14” – Parked on Sierra. ZD575/Odiham wing/Chinook HC4 c/s “Vortex 457” – Parked on Sierra. 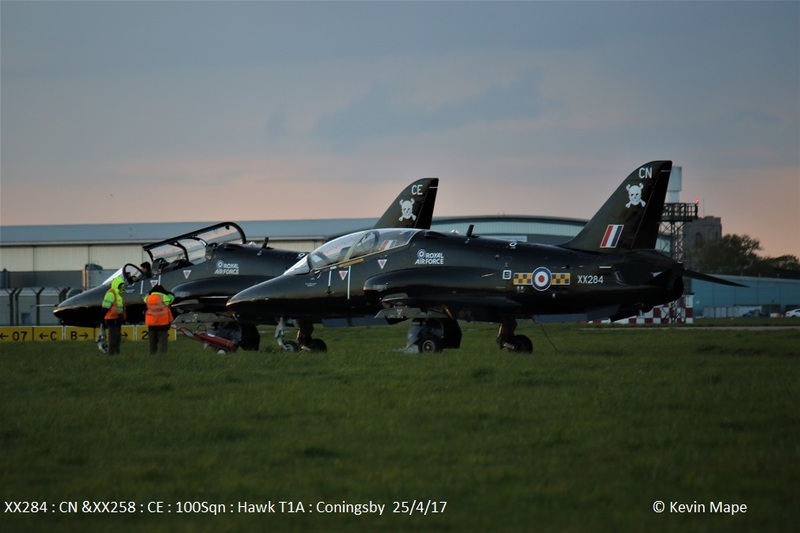 XX258/CE/100Sqn/Hawk T1A c/s “Pirate 20” – Mission. 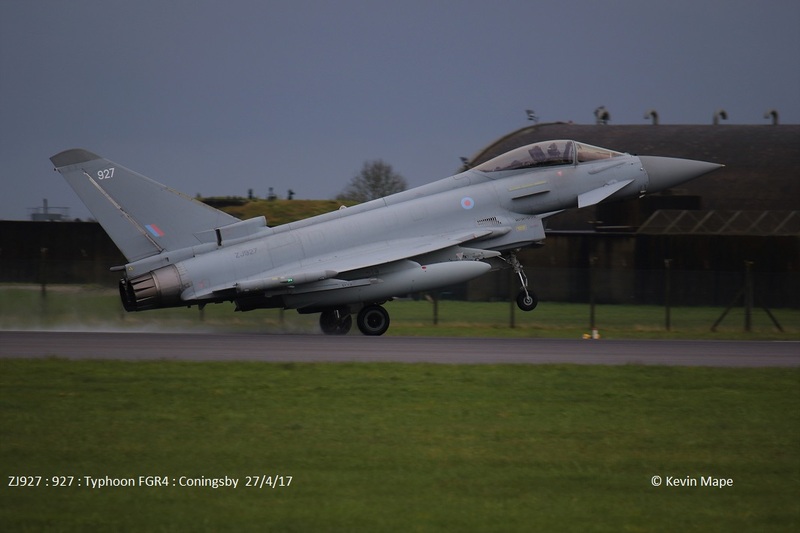 ZJ912/DR/XI(F)Sqn c/s “Chaos 22” – Ground abort. Noted on Sierra all three night stopped. 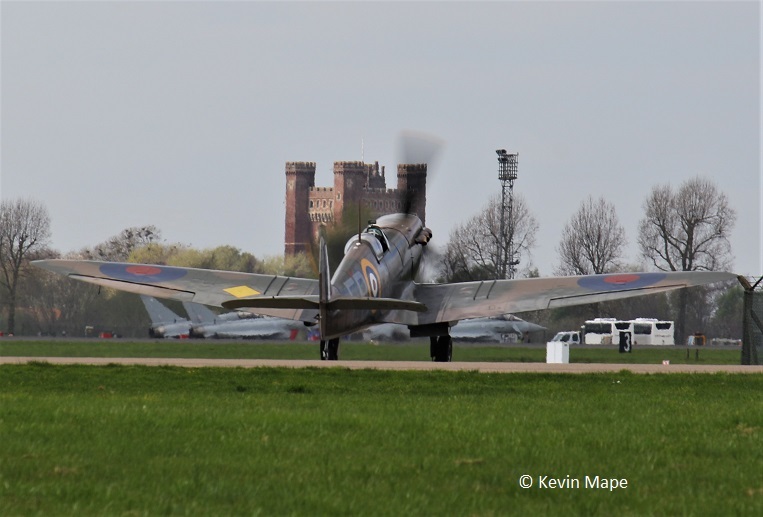 TE311/BBMF/Spitfire LF XVIe – Engine runs. 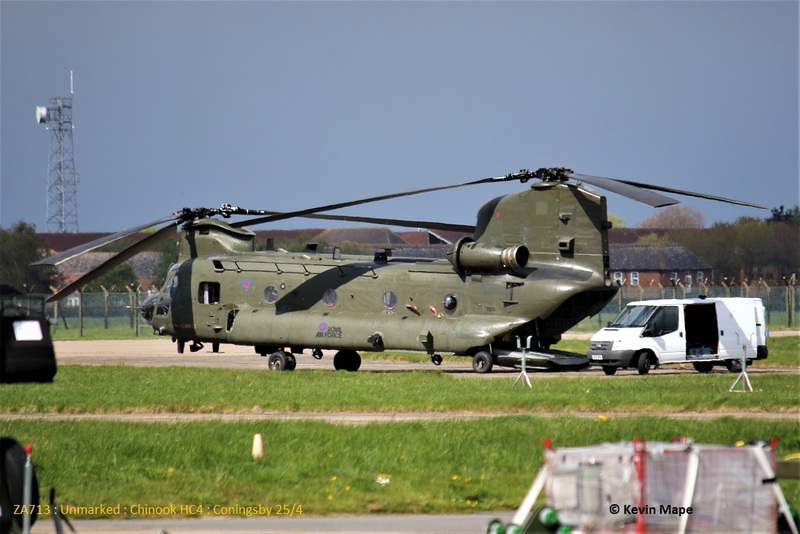 ZA713/Odiham wing/Chinook HC4 c/s “Vortex 436” – To Holbeach. ZK315/41Sqn 100 year special c/s “Rebel 58” – Ground abort. ZJ929/929 code only – Towed from HAS 10 to HAS 1 for QRA duty. 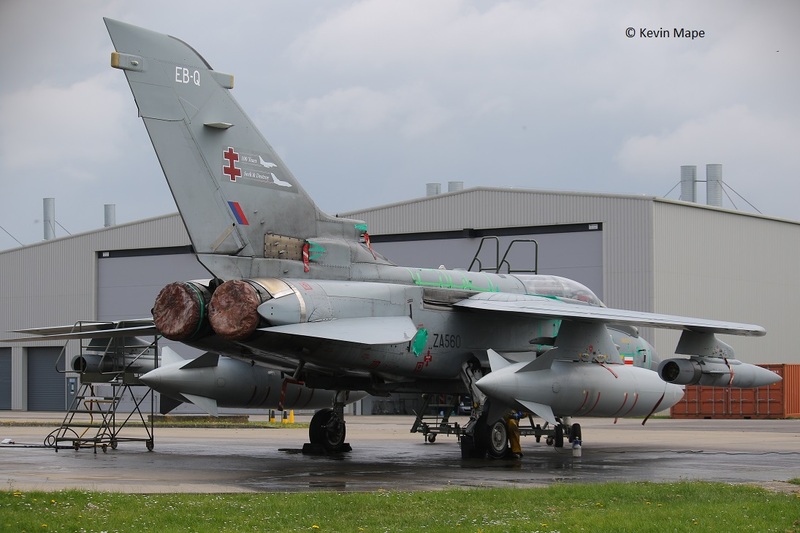 ZJ914/DZ /XI(F)Sqn -Towed from HAS 1 to HAS 10 off QRA duty. ZJ929/929 code only – Towed from HAS 1 to HAS 2. G-MAJJ/Eastern/Jetstream 41 c/s “East flt 104” in “105” out. ZK558/Odiham wing/Chinook HC6 c/s “Vortex 484” – To Sierra to collect passenger then departed. Rear of 29Sqn Hangar – ZJ927/927 code only. ZA680/Odiham wing/Chinook HC4 c/s “Vortex 436″`- Departed to Holbeach. No.064/YY/EAT00.319/Xingu c/s “Cotam 1726” – Departed. 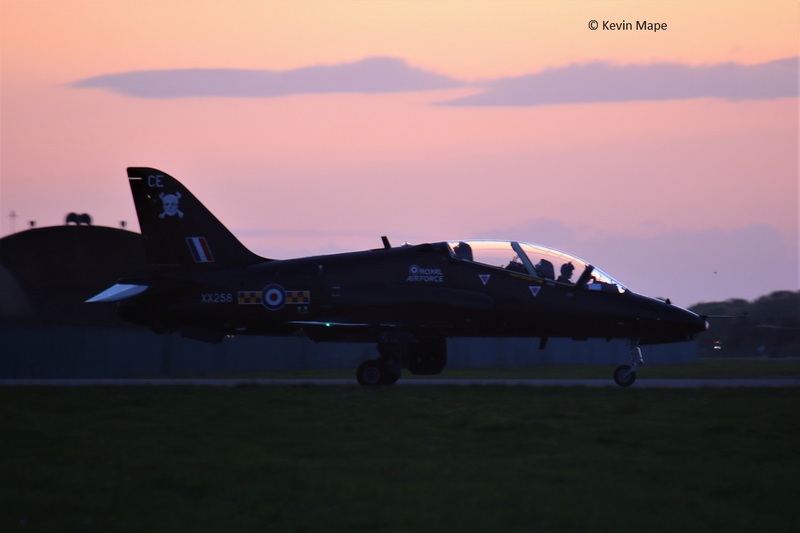 ZJ805/BD/29(R)Sqn – Towed into Foxtrot. ZA680/Odiham wing/Chinook HC4 c/s “Vortex 436” – To Sierra then Departed to Odiham. 41(R)TES – EB-E, EB-G, EB-R, EB-L and ZK315 100yr special. 29(R)Sqn BC. BY. FY. 373. 930. BE. BG. BV. 927. 810 on its own with paveways. 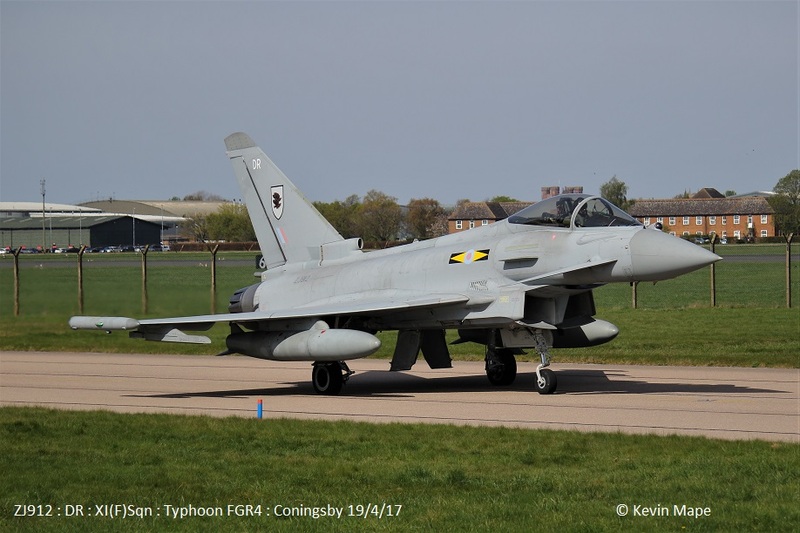 ZK348/FN code only c/s “Typhoon 278” arrived from Lossie. – Delivery to TMF. ZJ690/5(AC)Sqn/Sentinel R1 c/s “Snapshop 01” – Overfly. ZK339/EB-E/41(R)TES c/s “Apollo 11” with flares trials. ZK365/EB-L/41(R)TES c/s “Apollo 13” shut jet down on osp for disarming on return then towed to asp. AM Days flying included, Log required. 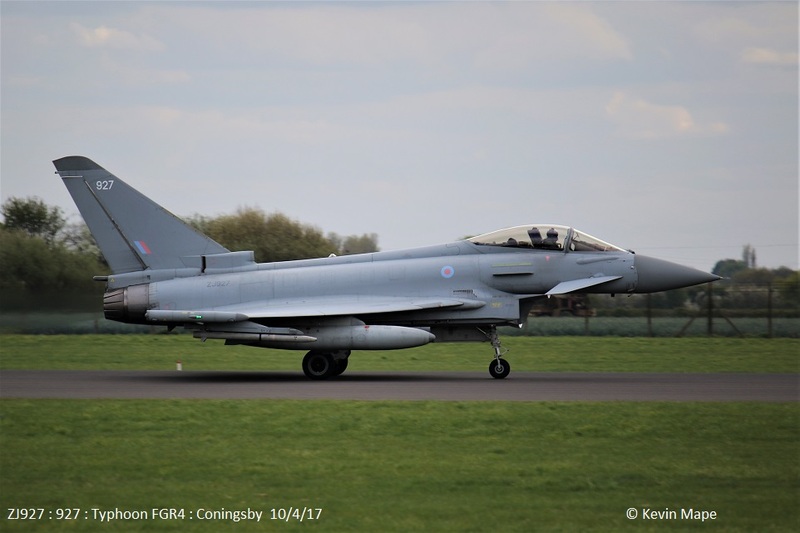 ZJ814/814/29(R)Sqn c/s “Triplex 11” To Lakenheath to play with F-35’s. 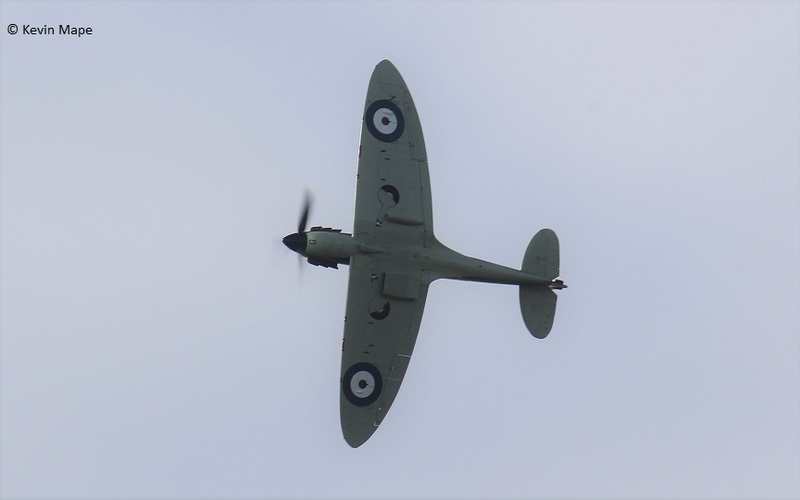 P7350/EB-G/BBMF/Spitfire F IIa c/s “Spitfire 90” – Air test. PZ865/EG-G/BBMF/Hurricane IIc – Engine runs. TE311/BBMF/Spitfire LF XVIe c/s “Spitfire 90” – Air test. 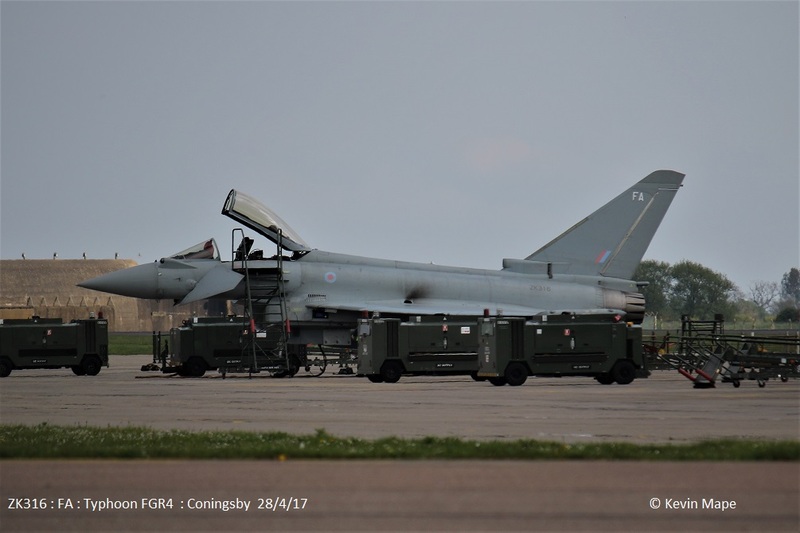 ZJ942/DH/XI(F)Sqn c/s “4Hotel Extra 32” – QRA practice. ZK316/FA code only c/s “*********” – Delivery to TMF from Lossimouth..
Spitfire LF XVIe : TE311. Spitfire PR XIXe : PS915. ZK304 : FM : code only : Arrived 18/5/15. 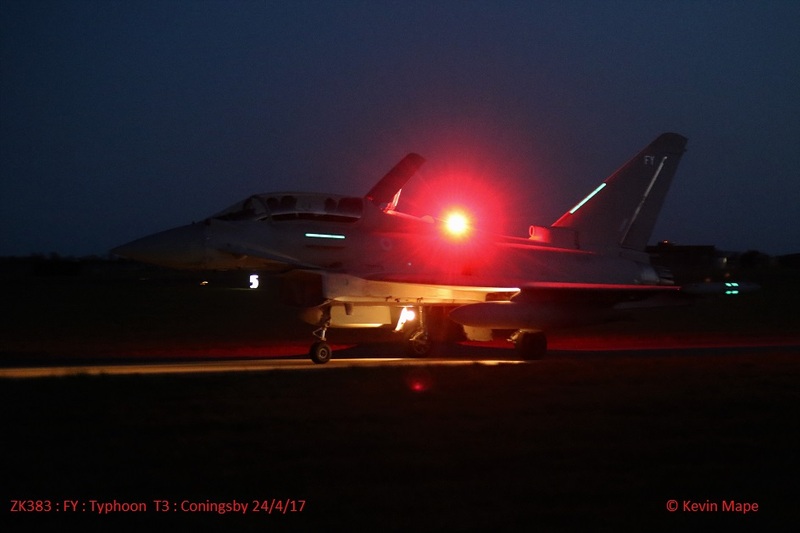 – Towed into Echo 19/4/17 for 3(F)Sqn. ZK316 : FA ; code only : Arrived 28/4/17. ZK307 : O : code only : – mods. 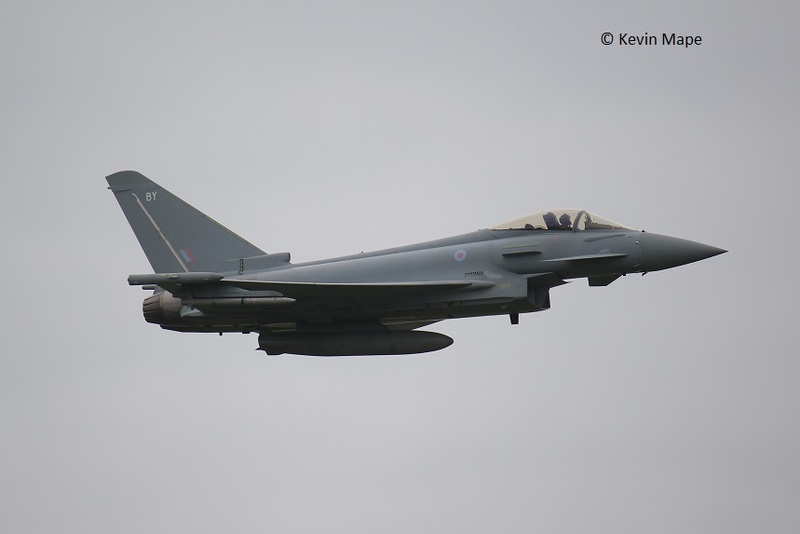 ZK326 : FB : 1(F)Sqn – Stored. ZK349 : GN-A : BoB special : Noted on the ASP 7/3/17 Engine runs. – Towed into the Old paint shop 4/4/17 for Repaint to Grey. ZK366 : Unmarked: Noted on the ASP 27/4/17 . RTP Line This line is about to start. ZK376 : u/m :- Arrived 14/3/17 c/s “Tarnish 69” – Noted on the ASP 12/4/17.